LinkedIn continues to evolve at a fast pace – but is your profile still stuck in pre-2013 times? I’ve blogged about LinkedIn profile mistakes as well as LinkedIn profile inbound marketing tips. It’s time to provide you all an update aligned with all of LinkedIn’s changes to help you create the perfect professional LinkedIn profile. Consider your LinkedIn Profile to be equivalent to the front page for the website of you. Whatever activity you do on LinkedIn, it will always lead people back to your profile. Think of all the time and effort that businesses put into investing into creating a well-branded and strategic website. Have you spent even a fraction of that time in thinking about how to create a strong professional LinkedIn profile? Even if you think you have your bases covered, review your professional LinkedIn profile while you read this. Better yet, ask someone you trust to read this and then give your professional LinkedIn profile an audit. You might be surprised what they find! Note: If you are a college student, check out my LinkedIn profile tips for college students post! I’ve blogged about LinkedIn photo tips in the past, but it bears reminding that unless you need to hide your face in the public for personal security reasons, you should always have a professional looking photo represent you. You might be able to get around not having a photo, but as studies show in having photos in Google search results, those with photos might expect a significant increase in CTR (click-through rate) after people find you in LinkedIn search results. Actually, LinkedIn themselves have said that profiles with photos are 7x more likely to be viewed by others. And, besides, if you want to make a deeper connection with someone, shouldn’t you be showing your real face? I talk a little about the SEO (search engine optimization) of your profile below, but those that put in keywords, or even worse phone numbers,as part of your name look cheesy and like you’re blatantly out to sell me on something. LinkedIn is the most trusted social network out there, so you should have a name that is cognizant of that and stay away from gimmicky nicknames. You’ll have plenty of other areas in your profile where you can differentiate yourself. Speaking of areas to differentiate yourself in your professional LinkedIn profile, look no further than your professional headline, the 110 characters that appear prominently just under your name both on your profile, and more importantly on search results. You don’t need to put here that you are TITLE at COMPANY NAME – viewers can see that in your profile. You need to include information in your Professional Headline that will draw your potential visitor into wanting to find out more about you. Be explicit as to how you can help people – but do it in a professional and well-branded manner. Overtly selling to people in your Professional Headline feels like a slap in the face to many a LinkedIn user. Ouch. Here’s counter-intuitive one, but it’s important to put yourself in the shoes of your target visitor. I live in Orange County, California, but if I was in charge of a territory that was primarily centered around Los Angeles, I would want to change my location to Los Angeles. It makes me more approachable in my target market because I’m considered “local,” and it also means I get found in more relevant search results because many are using the location feature to filter results. The concept here is the same as in optimizing your location. What would the type of person you want to find you enter in the “Industry” field? This can be tough because even those that work at the same company as you might list different industries here. One interesting thing is if you have upgraded to a paid LinkedIn account, your complete “Who’s Viewed Your Profile” will also include data as to which industries best represent the visitors to your profile. You might have to do some experimenting here, and not everyone uses the Industry feature to filter search results, but you should put your best foot forward and experiment in seeing how changing your industry might affect your profile views. LinkedIn provides you with a default URL which you can – and should – customize. Some talk about the SEO benefits of doing so, but I look at it this way: Once you’re invested in LinkedIn as part of your professional infrastructure, you’ll probably want to include your LinkedIn URL in your email signature or even print it on your business card. 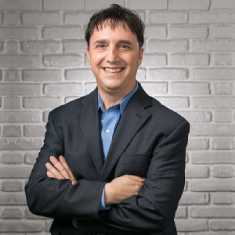 Wouldn’t you rather have a professional looking – and easy to input – URL like http://www.linkedin.com/in/nealschaffer rather than http://www.linkedin.com/pub/neal-schaffer/4a/z89/145/ ? 7.) Your Activity will show your latest status update – do you have one? When this feature was rolled out in early 2009, many were asking, “What should I use my LinkedIn status update for?” Since that time, posting updates of our lives has become a common part of our culture, whether it’s through Facebook, Twitter, a photo on Instagram, or even in our enterprise using Salesforce Chatter or Yammer. When someone finally lands on your profile, your activity section will show your latest status update – if you have one. This is the only dynamically updated part of your profile which gives others the ability to see what’s on your mind, so get into the habit of updating your status on a regular basis. Sharing thoughtful, insightful, and relevant news that might interest your target visitor just once a day is a great way to keep your professional profile “fresh” – as well as engage with your own network of connections! Updating your status update should be part of your daily LinkedIn routine but will undoubtedly be one of the more time-consuming tasks in this checklist. One of the others will be writing a well-crafted and branded professional summary to support your professional LinkedIn profile. If your Professional Headline served the role of luring visitors to your profile from people search results, your Professional Summary must expand upon that branding further while also supporting what you say in your headline as well as potentially ending with a good call-to-action. You must “close the deal” by making sure that, after your profile visitors read your Professional Summary, they will be sold on you and want to initiate contact. If you work for a company who is cognizant of their employer branding, you might want to ask your HR or Marketing department if they have a standard paragraph you could use to showcase the company you work for. Either way, if there is one area you want to spend time on crafting a few well-versed paragraphs, it’s here! Your professional LinkedIn Profile is about helping you get found: It is an Inbound Marketing tool. That’s why it’s important to connect the dots with your past as much as possible to allow as many people from your past to find you – and for you to be able to find them. Don’t stop at your current employer: Go back in history and fill in every employer you’ve ever worked for and educational institution you’ve attended. I go as far back as high school on my own profile, and even include short-term study abroad programs – which have helped me restore old ties with valued professionals in my network. I wrote about how you can leverage using keywords in your professional LinkedIn Profile in my Windmill Networking: Maximizing LinkedIn book way back in 2009, but there are many who either a) haven’t leveraged it enough or b) over keyword-stuffed their profile to the point that they make come up high in search results, but the more someone looks at their profile, the more they realize they’ve been duped. Whenever I speak on LinkedIn I offer this advice: Do a search for keywords for which you would like to appear in LinkedIn search results. Look at the profiles of those that appear in the top few results. Examine the location and frequency for which they’ve placed those keywords. Now take that knowledge and apply it to your own profile. The LinkedIn search algorithm is similar to Google: No one knows exactly how it works and it change at any time. So instead of being fixated on the search results, in addition to the exercise I just mentioned, consider adding as niche as possible keywords to your profile to differentiate yourself. Keywords really do matter: One of the case studies in my Maximizing LinkedIn for Sales and Social Media Marketing book was about a gentleman who generated 50% of his annual revenue because he was the only person who came up in a search result living in a certain country working in a certain industry who utilized a certain keyword. With all of the quid pro quo recommendations you see out there, many ask if LinkedIn recommendations are for real. Yes, they very much are in the context that they help you establish credibility if someone viewing your profile doesn’t know you. When I speak on LinkedIn, I often talk about how I was looking for a realtor on LinkedIn and found three good looking profiles. One had zero recommendations, another had two, and another had about more than 30. Who do you think I first contacted? You don’t need to have 30+ recommendations, but a few real recommendations can go a long way in helping to establish your credibility. Of all the features that LinkedIn has released, endorsements are the one that have stirred the most controversy in the professional community. I believe you should avoid that controversy and need to utilize whatever functionality LinkedIn provides you. With that in mind, there are great ways in which you can utilize LinkedIn endorsements. For the purpose of your profile, you should at least be editing your Skills and make sure that those that you want associated with your brand comprise all of the maximum 50 you can display. Some believe that endorsements might also affect how you appear in LinkedIn search results. It’s time to stop ignoring endorsements and embrace them by letting them show off your skill set and providing your profile with a little bit more credibility (although not nearly as credible as having good recommendations, of course). LinkedIn has given you the opportunity to add visual elements to your profile for some time, but have you leveraged the opportunity? Unless you’ve been living in a cave without the Internet for the last year, we’ve seen the emergence – and importance – of the visual in social media marketing. This primarily includes photos and videos but it applies to memes (like the one I’m using at the top of this post) and all sorts of graphics – and even presentations. LinkedIn gives you the ability to upload contents from a link (presentations from SlideShare or Prezi, videos from YouTube or Vimeo, and documents from Scribd are all supported), or directly from your computer (in addition to images, PDF, Word, and PowerPoint presentations are supported). If you’ve ever been interviewed or had your picture taken at a professional event, this is your chance to promote yourself by adding these visual elements. But don’t stop there: This is the area where you can be as creative as you want to be. If you’re lacking in ideas, ask your creative marketing folks for ways in which you can help promote your company through uploading visuals onto your profile. Even uploading your standard corporate presentation will at least provide something for your viewers to look at – and it might provide you business benefits as well! How contactable are you? If you’re on LinkedIn looking for business opportunities, you need to make sure that you make yourself easy to contact. If you’re a 3rd degree connection or beyond, many won’t go through the hassle of sending a high-risk introduction or buying an InMail in order to contact you. LinkedIn gives you the ability to include your contact details, such as up to three websites and a Twitter handle, for anyone to see. There is also a “Advice for Contacting [Name]” section where you could include your email address and/or phone number. You also have the option of subscribing to a paid plan and joining the OpenLink Network, giving those not in your network the opportunity to email you without having to pay for it. Don’t make it hard for those who want to get in touch with you to contact you: If they can’t easily contact you, they might just move on to the next person! Why would I mention joining LinkedIn Groups as part of a blog post on professional profiles? It has to do with your contactability: Joining the same Group allows others to contact you using the Group messaging feature. Which LinkedIn Groups should you join? You don’t have to join the maximum 50, but at least join a few groups that are related to your industry, discipline, or location – not to mention alumni groups from your university or even previous workplaces. If you haven’t been active in groups before, you might be surprised as to the business opportunities that exist within LinkedIn Groups! Even if you don’t have time to be active, displaying those group logos on your profile increases your contactability. If these are important to you or your professional brand, you’ll want to make sure they’re part of your professional profile. 17.) Are you connected enough? 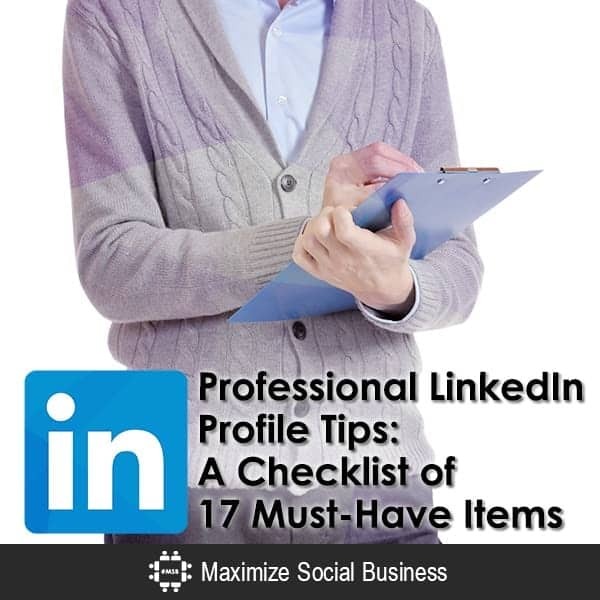 Any other tips to add to this professional LinkedIn profile tips checklist? Hello, Neal, your article was very innovative also checklist given was very awesome this will surely help in maximizing social business for every startup. Thank you for your suggestion, the tips mention by you will surely help full in enhancing your LinkedIn profile. The key comment I receive is that I post so frequently. Being consistent and sharing content, to me, is the basis of success with LinkedIn. I’ve had the same feedback Edwin. LinkedIn is not Twitter, so if you are getting that feedback, you might want to lower the frequency of your posting on LinkedIn. That’s what I did. Great tips for maximizing results on Linked In~ Thank you! Thank you, Neal, for the checklist. I don’t think the status update is still being used on LinkedIn. If it is, I haven’t seen it in a while. Can you verify? Sometimes a second pair of eyes is good! :) Thanks! Yes, Janet, the status update is still there – you need to go to the home page where at the top you should still be able to see the box! Also Neal did you see the recent study (I read it on Social Media Today, I think, can find the link later) that said 64 percent of all website traffic coming to corporate websites via Social Media was coming from LinkedIn?! Hey John, thanks for chiming in and your suggestion. ALL CAPS, to some people, might seem a little “in your face”. I agree that it is a unique way of visually organizing things, but it “might” be a turnoff to some. Really depends on your own branding as well as your target market as the LinkedIn demographic is the most sophisticated of any social network. Excellent list. Recommend this for all those interested in improving their social presence through linkedin. Thank you so much for this concise, well-written and explained list. I am working to improve my profile and this is outstanding advice! You’re very welcome! Good luck to you! After reading this, I have a lot of work to do to utilize LinkedIn better! Thanks for the clear checklist. You’re very welcome Ron! Good luck with it! Thank you very much for sharing valuable tips! Additionaly I am allways tying to meet my contacts in person and facilitate their business as much as I can! You’re very welcome Vladimir! Yes, your profile is static, but you also need to be dynamically networking in person as well! Good solid checklist. Thanks I have some work to do. Am I the only one who feels like LI is doing a much worse job than previously about controlling the spammers & scammers? Seems like a ton of my LI communications are junk. I think it’s more about an increase in spammers than anything else Harold. Neil….ABSOLUTELY NEEDED!! This information confirmed a lot of the ‘helpful hints’ I have received along the way BUT was not fully convinced on some items. Much Gratitude in sharing this wisdom! You are a SOCIAL MEDIA EXPERT !!! Neal, Very comprehensive post. I noticed that Tip #14 mentions you can include links to 3 websites and your Twitter account. Is that still true? I thought that feature went away. If it’s still around, please share where to find it and use it since it no longer appears on my profile. I totally agree with your point about adding multimedia to your profile. I think it’s essential to do so. The only other tips I’d add are: 1. You can move sections around to customize the flow of your Profile; and 2. Insert in there somewhere that you have a Company Page and share the name for searches should visitors like to learn more about your Company. Thanks for creating this post! Thanks for the comment Michael! Yes, you can still edit your three websites in “Edit Contact Info,” NOT “Edit Profile.” Moving sections around is also a great idea – might not be used by everyone but can come in handy. As for the Company Page – well, that would be covered in an upcoming How To on Company Pages ;-) Thanks again for stopping by and commenting! I was surprised to see LI generated more engagements vs. my Google+ profile which I use 10x times more but since my G+ posts talk to my LI Groups using Friends+Me I get to see and share what’s important on both platforms. LinkedIn is getting better at becoming an engagement-generating platform … and more professionals are learning to engage on the platform! Great article Neal! Thanks for the refresher and a swift kick to take a new look at my profile and my keywords! Rethink time! Cheers! Neal, the keywords are what get me on LinkedIn. There are so many people doing what I do, I’ll be lucky to appear on the 10th page of the results! Is there a way to narrow that down any? I’ve been doing “Social Media Psychology” lately, maybe that’s a narrow niche? Wade, I never ended up writing a blog post about it, but there was awhile when I was shut out of LinkedIn search results. That’s when I learned that you can’t rely on search results – you need to engage. Hope the advice helps you my friend! Great list of must-haves! Thank you, Neal, for providing such a clear, concise checklist.